How do I understand Hilbert's map in this answer? The author of the answer has mapped the hash value (integer) of some strings to a 2D image. I understand that Hilbert's curve is a technique for 1D <=> 2D transformation which preserves locality of the points. My question is, what can I infer from this 2D image about the different hashing algorithms? I understand that two strings having nearby hash values are transformed to nearby dots in the image (but the opposite is not true). But, what information does this say to me? Do they say any information about collisions? If yes, how ? I understand white color says that no string has been hashed to those locations. But what do the remaining colors say? ... which preserves locality of the points. So adjacent hash values will be adjacent points in the image. That means that if some hash value ranges are rarely used, and others are densely used, it will be visible in the output. In other words, it visualises uniformity of the hash values over their output range. It doesn't tell you anything about collisions. 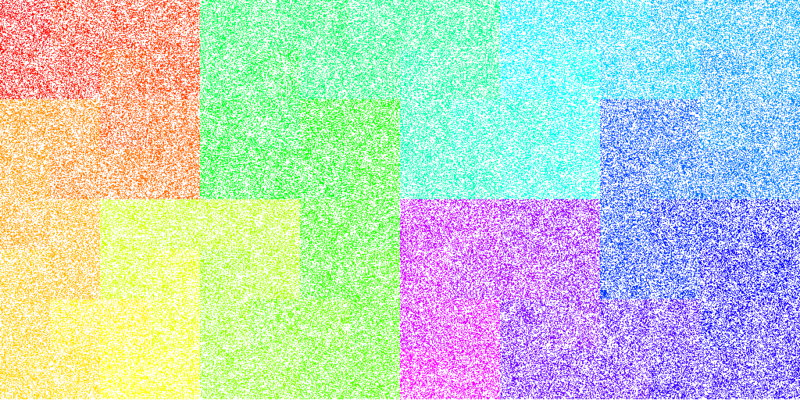 The colour hints at the spatial grouping of hash value ranges, but is more decorative than useful IMO. if there are shortish ranges of consecutive values which are never set, they might be easier to spot as squarish white grains in the Hilbert map, than as short horizontal white lines scattered around the linear map. Edit: the original image linked for easy perusal. The colors in the image are just a gradient from red at the minimum (1) to purple at the maximum (9). So in the first case you get a smooth gradient from top to bottom, in the second you would get clear borders e.g. where 2 borders 9. Now it actually looks "random". The second shortcoming is the big gap that occurs between consecutive numbers when you go to a new line e.g. 3 and 4, 6 and 7. This can also make it difficult to see problems. A Hilbert map avoids both shortcomings: consecutive numbers are always adjacent, and it has no real "width" since it snakes around on itself to fill the space. But I think the author there is just including it for a bit of fun (notice he only uses it for one example). If anything the Hilbert map makes it harder to see defects in the hash because the human eye cannot easily discern the tiny twisting path in the image. The width of the "linear" map is actually a benefit, not a shortcoming. It gives values that are multiples a geometric relationship: they all fall along straight lines in the image. It's true that viewing the image at the "wrong" width can make this hard to see, but usually if you try a few different widths the defects will become immediately apparent. I don't think the Hilbert map would have this property. The author of the linked answer is using two different visualisations of the distribution of hash values, as a "looks random to me" test. Being indistinguishable from a (good) uniform (P)RNG is a desirable characteristic in some uses of hash functions. The patterns in the images for "zip code" hashing are the sorts of patterns, which for a PRNG, would indicate a "bad" distribution. It doesn't give useful information on collisions. You'd have to count the pixels, and it wouldn't show where the collision was. The table on collisions is a much better source for that. The colour is just a mapping of hash value -> hue. It could be a monochrome image and convey the same information. Not the answer you're looking for? Browse other questions tagged algorithms hashing hashtable or ask your own question. What is the difference between a hash and a dictionary? Is there any design pattern to remove elements from a hash map? How do I generate multiple hashes that can be resolved to a single value?